It’s time to bake bread again! 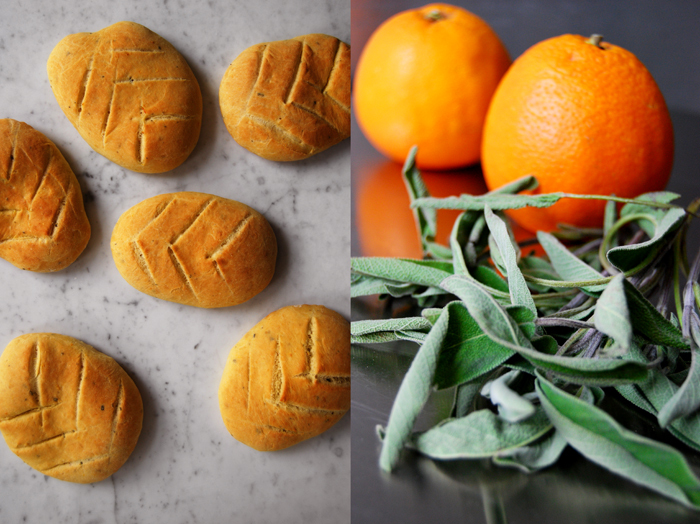 I use a recipe which involves sage and my beloved blood oranges, they’ll be out of season soon, so I’m using every possible occasion that allows me to cook or bake with my sweet citrus fruits. I mix generous amounts of their zest and juice into the dough and the result is impressive! My bread is a light and aromatic Fougasse, a French flatbread very popular in Provence where it’s often made with olives, herbs and cheese. It’s similar to the Italian Focaccia but with a leaf pattern of cuts in the dough. In some recipes, the cut goes all the way through creating holes in the bread while it’s baking which makes the bread harder. I prefer to leave mine juicy with shallow cuts on the surface. Besides the orange and sage I add good olive oil in and on the bread. I use the wonderful extra virgin olive oil from the Molise region which I got from Marilena. 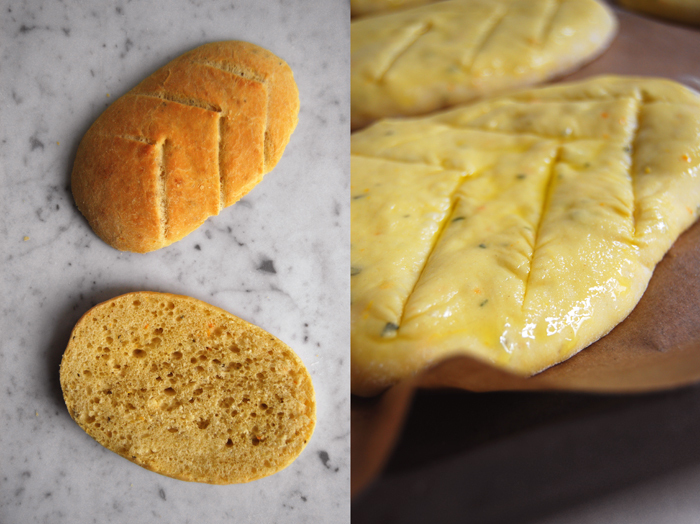 Its strong and fruity taste is just what my Mediterranean flatbread needs! I already have a great idea for a sandwich I can make with this bread for tomorrow’s Sandwich Wednesday! Combine the flour, yeast, salt, orange zest and sage in a large bowl. Add the water, orange juice and egg and mix with your dough hooks for 5 minutes. 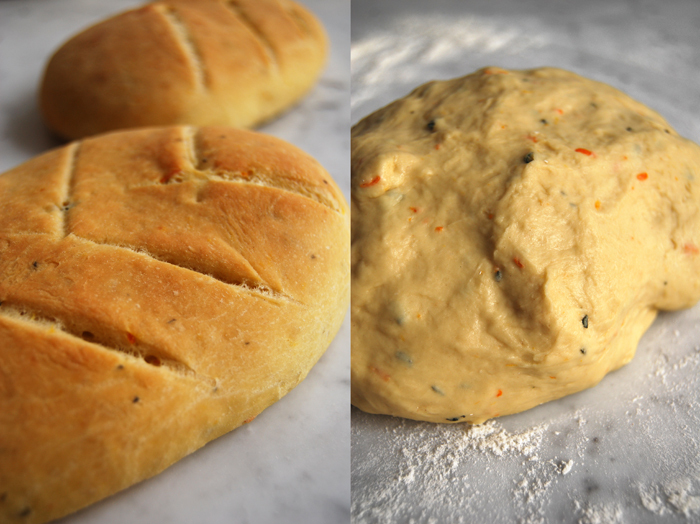 On a floured surface, continue kneading with your hands for a few minutes until you have an elastic dough ball. Put the dough back into the bowl and cover with a tea towel. Let the dough rise in a 35°C / 95°F warm oven for 45 minutes. This works really well but make sure that your oven is set to top/ bottom heat and not to fan. Take the dough out and punch it down. Divide it into 6 pieces and roll them out into egg shaped discs (on a floured working surface, around 1 1/2 cm / 1/2″ thick). Put them on a baking sheet lined with parchment paper, cover with a tea towel and let them rise for 20 minutes. 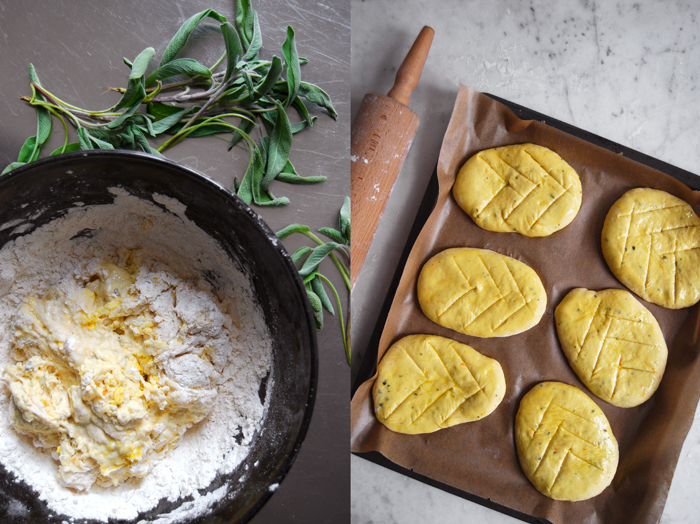 Brush the flatbread with olive oil and cut a pattern of 6-8 diagonal slashes into the dough to make a leaf pattern. Bake the flatbread on the lowest level for 12-15 minutes or until golden brown. Take them out and let them cool for 2 minutes. I cut the warm flatbread in half and drizzled some more olive oil over it, it merged perfectly with the orange and sage aromas! These little breads are so delicious and so beautiful! I just baked them three times, the third time quite now for breakfast and always double amount. Just when they are ready, they get little feet and run away to the neighbours, family and friends. Its stupefying! Today i will eat them with salmon and cream cheese. Photos from my first try will come in the next days on my blog, perhaps you are interested. Orange is my favorite flavor…these sound wonderful! Have a great weekend, Meike. You would love them, the orange aroma is very strong! I drizzled some olive oil on top, it was so good, it’s one of my favourites, just bread and oil. A nice weekend to you too, Marigene!